« What Do You Need To Build A Gaming PC? Actually more than I thought at first. I was in the market for a mouse that had a bit of lighting, that allowed me to mess around with DPI settings freely and that had at least two thumb buttons. I got all of that and more with the G502 and I’m happy I decided to go with it! I’d like to go over some of the key features that the product pages boast about and elaborate on my experience with them so far. There are a bunch of buttons on this thing! 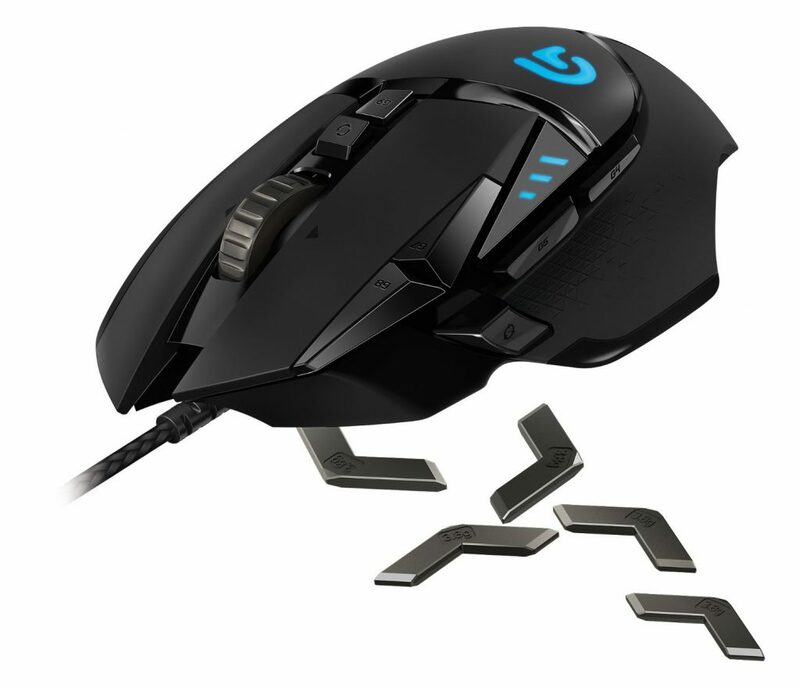 No, it’s not a MMO mouse with twelve different thumb buttons but there are more buttons than you’d think. Obviously we have the basic mouse buttons from the left/right click to the mouse wheel. These are a given with any mouse, The G502 has seven other buttons that have their own purposes as well. When it comes to a gaming mouse I almost NEED to have at least two thumb buttons on the side. They allow me to not have to reach across my keyboard to open up the map or my inventory in most cases. I love having the mouse shortcuts! These two buttons are placed optimally right next to where your thumb rests on the curve of the mouse. You lift your thumb up a little bit to be able to click them. They’re placed just right. A DPI shift button is placed more forward in the thumb position which makes it easy to hold while still moving the mouse around. This is the button that allows you to shift what DPI or what the buttons will be able to do. Next to the left click are two more buttons which allow you to move up or down the different DPI settings that are set within the profile that you’re using. If you need to switch between point and click back to precise shooter aim then this comes in clutch. At the top of the mouse there is a DPI switch and a toggle button for the scroll wheel. When you click the DPI switch it’ll switch over to another profile which will change the Logitech logo color indicating which profile you’re on. The scroll wheel toggle with switch the scroll wheel between clicking between scrolls and having a long scroll. Basically when you click this button, you’re able to have the scroll wheel go for a long time straight rather than it stopping itself with the ridges. This is great when you need to zoom in and out or if you’re browsing a long web page and you don’t want to have to do a bunch of different scrolls. One scroll and you’ll be able to reach the bottom of a web page in no time. I should also note that the scroll wheel is made out of metal. The overall quality of this mouse leaves me to think that it’s going to last a long time. An important part of any mouse on the market is the ability to be able to switch up how the mouse works. The more freedom you have on setting the DPI, deciding which button does what and having different profiles to switch to gives a mouse a lot more value. Logitech really knows what they’re doing when it comes to their gaming software. You only need the one software for any piece of hardware that they have on the market, you can switch between the settings of a mouse or a keyboard with a click of the mouse. I like that because some hardware requires you to have different software for the different pieces of hardware, it’s nice to have everything in one place. Setting the DPI and customizing each profile differently is a bit more in-depth than I had imagined it to be. You can set the DPI to 5 different levels for each profile. So if you’re wanting a bit lower DPI for a bit while scoping in on a sniper rifle or slowly moving your mouse during graphics development, you can. You just have to click on the DPI up/down buttons located right next to the left click. You can switch between profiles using the DPI switch in the top-middle of the mouse and you can change the lighting of each profile that way you know which one you’re currently using. Another thing about these profiles is that you’re able to set actual commands with the mouse. For example, I can tell the software that when I push and hold the DPI shift button that I can have different buttons be different keyboard commands. Want the middle mouse buttons to be Ctrl+T to transform in Photoshop in a breeze with one click? That’s what the software allows you to do! You can have any keyboard command from the mouse using this method and I think it’s awesome. It makes the mouse valuable not only for gaming but for doing graphic design and the sort as well. Pressing and holding the DPI shift button can also be used to have the mouse be at a different DPI setting while holding it. I found this useful while trying to scope in on a sniper in-game, I am able to have a steadier aim this way. 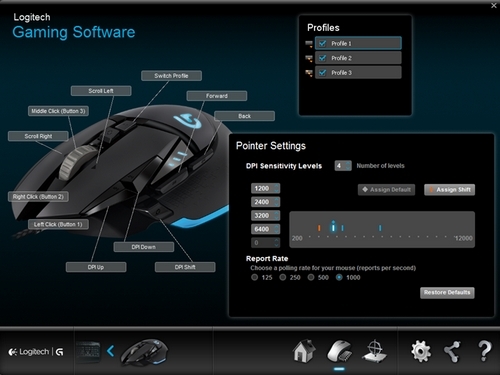 You can download the software right here from Logitech’s website. 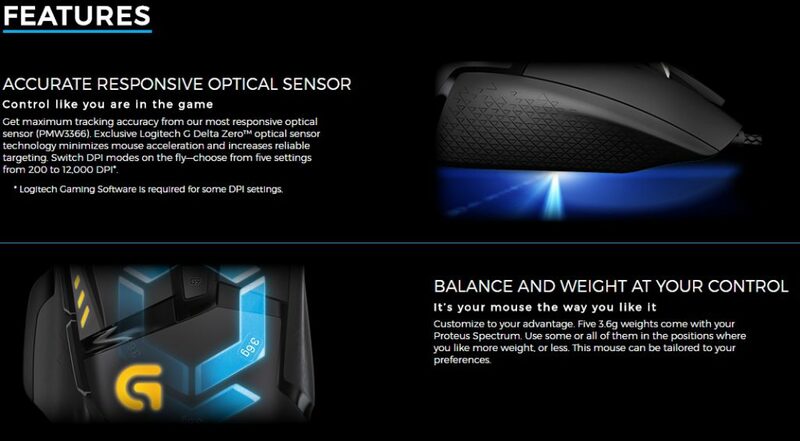 For the longest time I have always thought that being able to add weight to a mouse was a gimmick. Always thought it was a fake way for companies to add more “value” to a mouse. I’ve tried the mouse with all of the weights in, none of the weights in and with only a few of them in. I prefer the mouse to have all of the weights at this point as I feel like having the bit of extra weight lets me steady the mouse a little more. Now I’m not going to say that weights are an absolute game changer because the change is pretty minimal. I think that having the weights is valuable to some, I can see how some people would actually prefer the option. I can tell a difference in having no weights and all of the weights in but like I said, it’s not a complete difference. I wouldn’t be able to tell someone how many weights were in a mouse after using it randomly. Maybe in the competitive scene there is a niche of people out there that need to have exactly 3.6g of weight in the mouse to have the most precise aim. That’s not me, I’m more of a casual gamer and can hardly tell the difference. At least in my book it is. It has all of the features you could ask for in a gaming mouse and then some. An easy to use software, a comfortable design and quality material? This is definitely a winner. This marks the end of the review but I don’t think you should stop yet. Be sure to check out the reviews on Amazon if you’re interested in this mouse, don’t just take my word for it! So, what is your favorite part about the G502? Are you going to be picking one up? 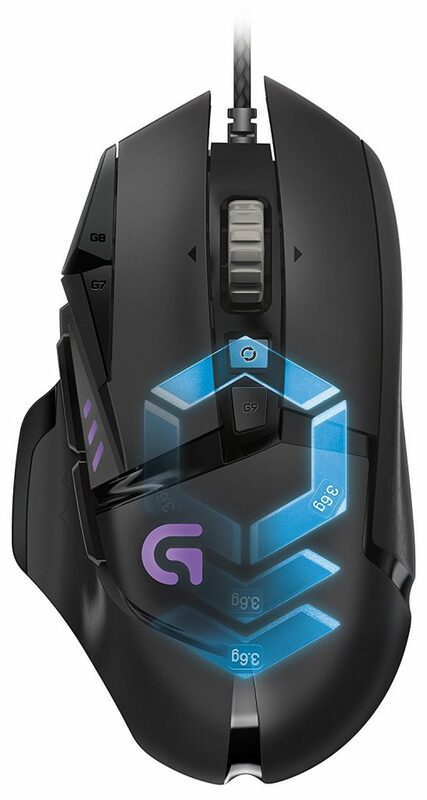 Tagged g502 proteus spectrum, logitech gaming mouse, rgb mouse, weighted mouse. Bookmark the permalink.